Every year, on January 26th, Indians celebrate the Republic Day. It’s a day of celebrations and honoring the country’s transition towards becoming an independent country. To salute this very important day, Indians all over the country hoist the National Flag at home, in schools, institutions, and at public places. They aim to enlighten their sight with the beautiful colors of the official flag. Each shade symbolizes something, including the Ashoka Chakra, which stands in the center of the standard. Sadly, not all Indians can feel the pride and emotions that come along with raising the flag. Visually impaired children are some of these people who cannot feel the joy of admiring their national flag. Because of their condition, they are deprived from feeling the magic of these colors in their full beauty. Yet, there’s still hope for them. Thanks to one of the largest industrial houses in India, MP Birla Cement, such children have now the chance to ‘see’ the flag and enjoy it not by using sight, but rather with their own fingers. The Indian Tricolor ranks amongst one of the most beautiful flags in the world. But we bet that the Indian citizens would feel the same admiration towards it even though there would be no colors to fill its spirit. Why are we saying this? Because MP Birla Cement, alongside with the creative team at Ogilvy Kolkata, managed to recreate it without using any colors. They poured cement in a specially-designed container and created a full concrete flag. So how can a cement flag be as beautiful as the traditional one, you might ask? Simple: it’s been crafted to be admired especially by blind people. Experiencing the national flag is an emotion that every proud citizen wants to feel. Visually impaired kids definitely feel the same, so there must be a way for them to ‘see’ the flag. And there is. 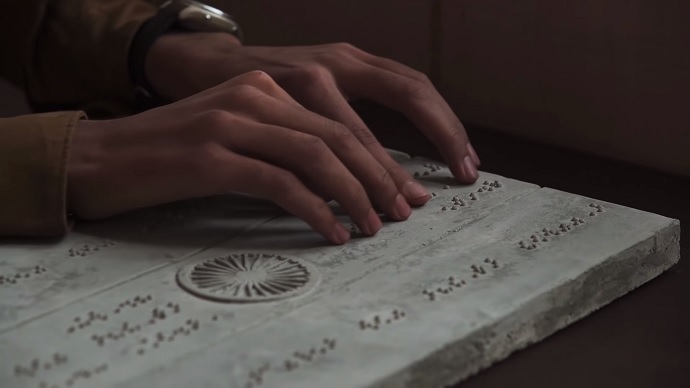 Meet the “Flag Without Colors,” a flag entirely made out of cement, that brings the meaning and joy of its colors and symbols through nothing else than Braille writing system. 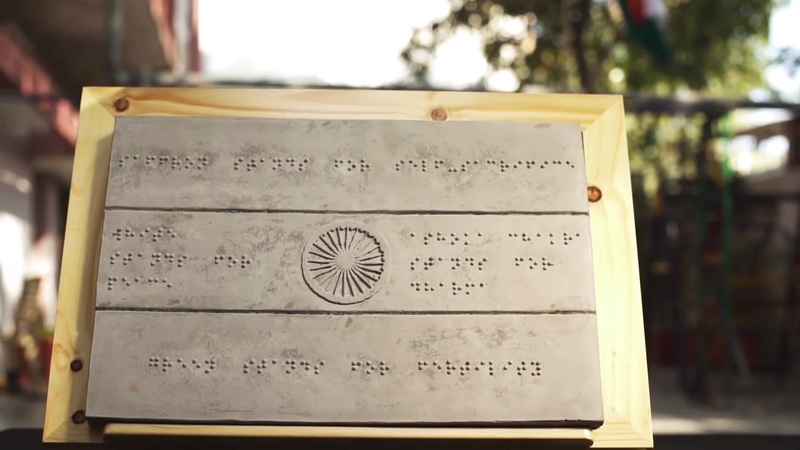 This one-of-a-kind Braille flag will be hoisted in various blind schools across the country, inviting the students to actually be part of the 70th Anniversary of the Indian Republic. To show how the flag works, the Kolkata-based agency created a short video that was shot at Seva Mandir School, Indore, one of the institutions which already put up the “Flag with(out) Colors”. Mr. Sandip Ghose, Executive President, MP Birla Cement, remarked: “In this 70th year of the Republic the values embedded in our Flag are relevant more than before. This is a small endeavor on our part to make the celebrations of the Republic Day more inclusive and carry the message of the National Flag to a wider cross-section of our young citizens”. “Republic Day is a celebration of the Constitution of India. It emphasizes on human rights and honors the freedom that the National Flag represents. This was just a humble attempt at including those who have been deprived of sight in a celebration that is rightfully theirs. I can only hope that someday, the ‘Flag Without Colors’ will become as common a sight as the tricolor,” added Sujoy Roy, Executive Creative Director, Ogilvy Kolkata. This initiative marks MP Birla’s second attempt to show the world what they have up their sleeve to help blind children fill their hearts with national pride. Prior to the Republic Day, the colorless flag was presented to children learning at Lighthouse for the Blind, Kolkata. Just like the students at Seva Mandir, the youths here had a chance to run their fingers across the flag’s markings and find out what the colors actually symbolize. “The glory of our waving flag is a heritage that belongs to every Indian. We simply wanted to share it with those who are deprived of its vividness. After all, freedom is everyone’s birthright,” adds Sujoy Roy. Who said that if you are visually impaired you can’t enjoy the beauty of colors?